I am a member of the Collective Bias® Social Fabric® Community. This shop about grilled chicken recipes has been compensated as part of a social shopper amplification for #CollectiveBias and its advertiser. During the summer we spend a lot of time outdoors, attending different sporting events, to include my own tennis matches, fishing and spending days at the beach. During the summer when bedtimes are extended, our family really values eating dinner together and then having some sort of family activity afterwards. So we need easy grilled chicken recipes for the summer. 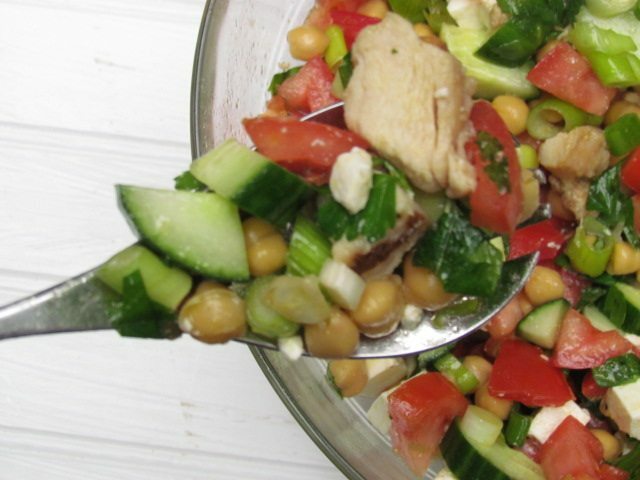 This salad that has blended some of our favorite foods together in a one of our favorite light and delicious chicken recipes. One of our favorite family activities in the summer is to watch movies. There is a drive in movie theater near our home, so that is a great way to get out of the house and enjoy the summer weather. I like it because you can pack a picnic dinner and eat it while you tailgate before the movies. This way we can still have some family time and not just be stuck in front of the screen. We are very excited about seeing the new movie BLENDED, coming out May 23rd. This movie stars Drew Barrymore and Adam Sandler. The previews look really funny and a great family movie. 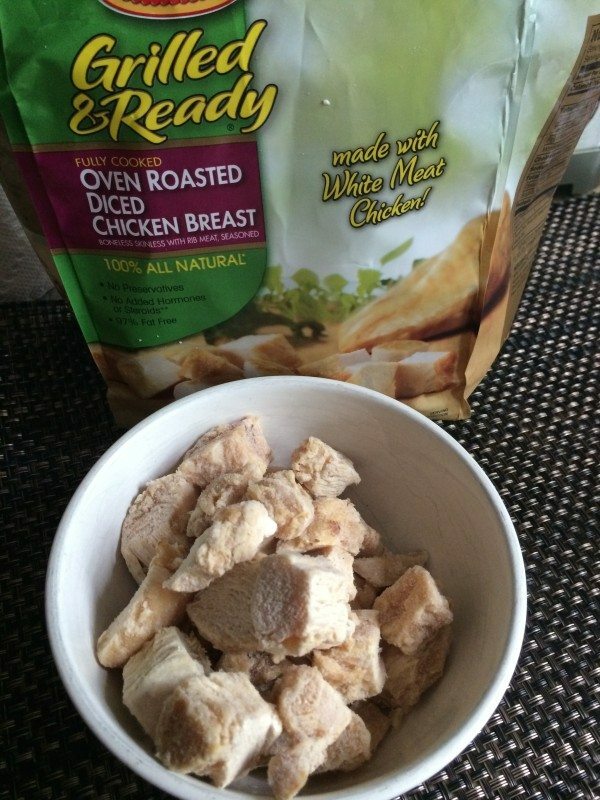 I decided I would blend some of our favorite flavors together in an easy and delicious chicken recipe that is perfect for transporting to the movies. I have not gotten to the best part yet, this recipe is super easy because you get to skip the step of actually grilling the chicken. Look what I found at our local Walmart Store. Tyson Grilled and Ready products just need to be warmed up, as they are cooked all the way through. The most tedious thing about this recipe is chopping all the veggies. Really how hard is this. 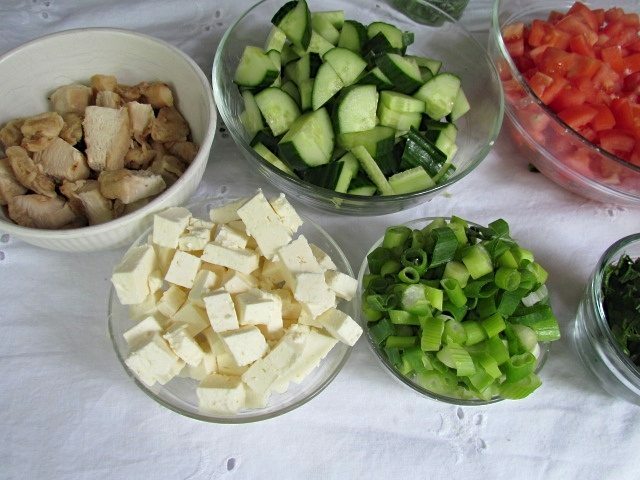 If you have fussy eaters you can have the kids assemble their own salads based on the flavors they enjoy. Go ahead and have individual plastic ware to create individual salads to pack along with you to movies or make one large salad. 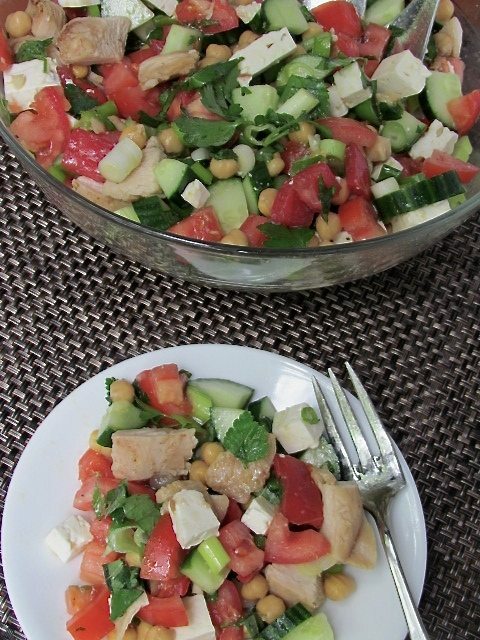 This salad is best made an hour before eating to allow all the flavors to meld, although I did taste it right after I assembled it and it was delicious. Did I mention some of us will be going to see the movie free too. 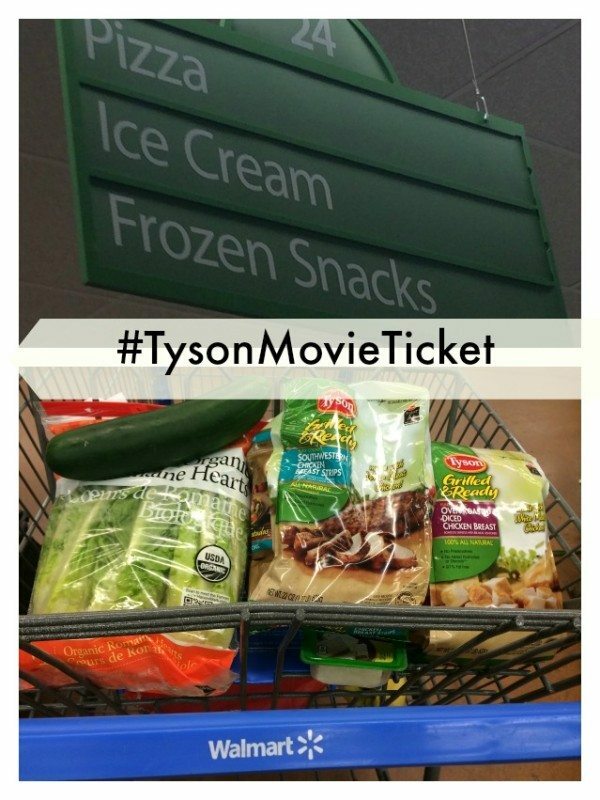 Tyson Grilled and Ready products are currently offering the #TysonMovieTicket promotion. Simply purchase 2 specially marked packages of Tyson Grilled and Ready Products and you can redeem them for free tickets to the movie BLENDED.. Check out Tyson, for more details and recipe ideas inspired by this Blended Promotion. 1. 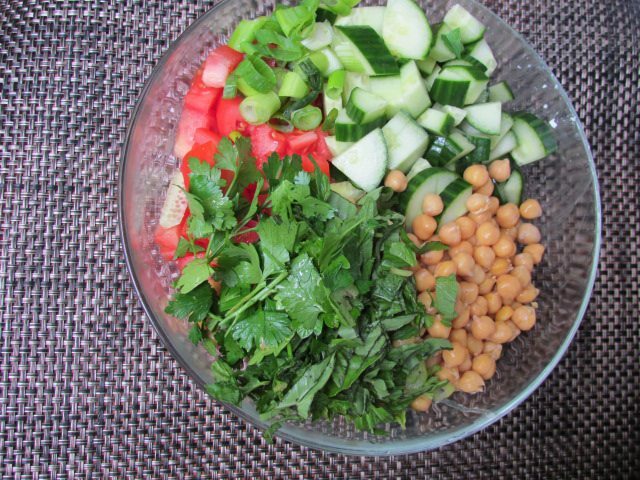 Place the scallions, tomatoes, cucumber, chickpeas, parsley, mint, and basil in a large salad bowl and toss to combine. 2. 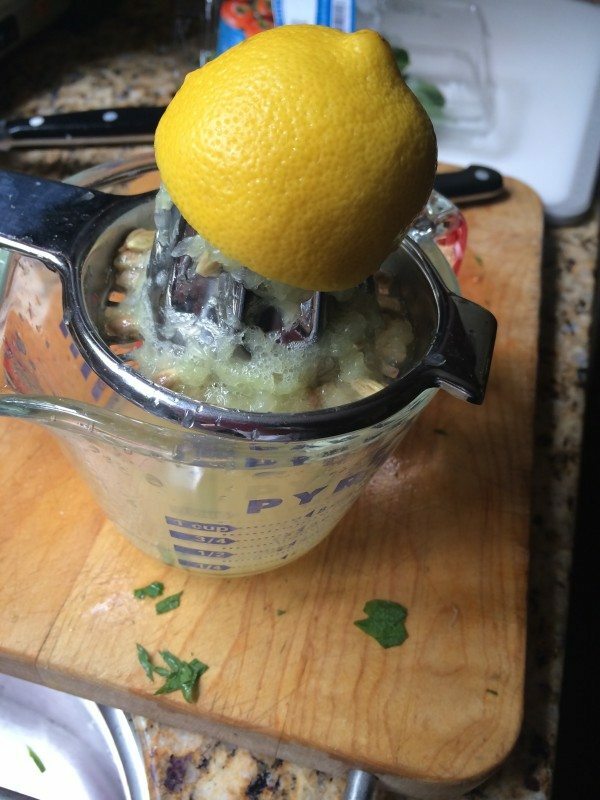 In a small bowl or measuring cup, whisk together the lemon juice, garlic, 2 teaspoons salt, and 1 teaspoon pepper. Slowly whisk in the olive oil to make an emulsion. Pour the dressing over the salad, tossing gently to coat all the vegetables. Add the feta and chicken , sprinkle with salt and pepper to taste, and toss gently. 3. Eat immediately or cover and allow the flavors to meld. What are your favorite Family summer activities? « Which Cell phone providers are best for kids? Looks really yummy! We love feta in our salads. Have a great weekend. Looks delicious! And I want to go to the movies! That’s a great promotion from Tyson! This is a full on meal of deliciousness! Plus everything in it is so healthy. I think I would feel 10 x healthier for sure! Thanks for this! 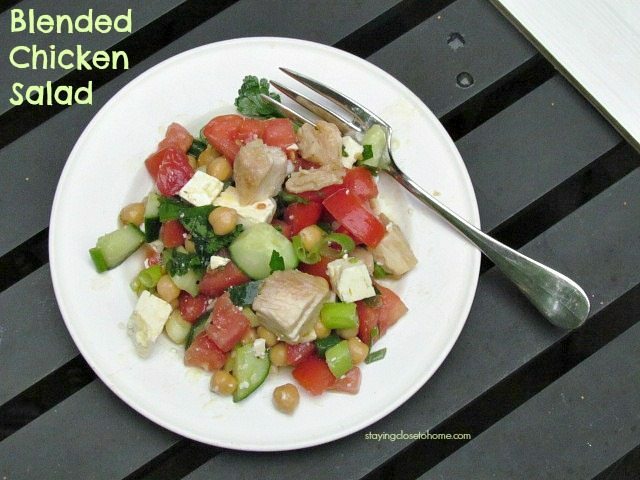 Chicken salads are my favorite! They’re my go-to choice for an easy lunch or dinner. Corn would be a great addition, especially when it becomes readily available fresh. Looks tasty and healthy as well. Looks tasty & low carb to boot. The salad looks so refreshing! YUMMMM!!!!! I could eat the whole bowl! This salad looks so refreshing and healthy. I can’t wait to make it. Perfect for the summer to eat pool side. Sadly I don’t have a walmart anywhere near me (work or home which is odd) but that salad looks DELISH! Your salad looks amazing! I can’t wait to try it! This recipe looks delicious! I will have to look for these grilled and ready selections. This sounds really good and refreshing! This looks like an awesome recipe. My family eats a lot of chicken! That is a great looking salad! I think we might have to have a salad for dinner tonight after looking at your pictures. I’m excited to see Blended. It looks really cute. I love eating salads with grilled chicken. I need to add corn to mine next time. I can’t wait to see Blended as well. This is a great recipe. This looks so delicious would be the perfect dish at a bbq! I love easy to make recipes like this. Especially when we are off at the beach all day in the summer, I have little motivation to cook a big meal. Mmmmm… this looks so yummy! These are great to know. We eat alot of grilled chicken here!